Portable spot air conditioners are a great cooling solution for various industrial heat problems. Oftentimes industrial facilities are large warehouses that consist of harsh conditions in terms of heat, dirt, oil and/or chemicals. These obstacles to traditional cooling make portable spot coolers the ideal economical choice for many applications. The consequences of not adequately cooling your industrial facility are many; lower productivity, lower output, and equipment failure to name a few. The end result is lower revenue, higher employee turnover, and a shorter life cycle for expensive capital equipment. Computer Room Uptime sells and rents several different MovinCool portable air conditioners specifically designed to cool down industrial facilities. 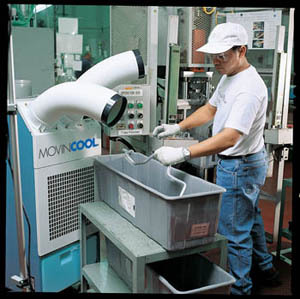 MovinCool pioneered the use of portable spot air conditioners to cool down their employees on the Toyota manufacturing lines in the early 1980s. conditioners to cool down an entire production floor and/or warehouse. Some areas will be subject to high ambient temperatures that will have a significant effect on employee productivity. In some cases, OSHA violations may occur. When products exiting a hot manufacturing process take too long to cool off, product quality and cycle times can suffer, resulting in lower output. High ambient temperatures can also negatively affect the performance of heat-sensitive equipment. This reduces productivity and shortens the life span of expensive capital equipment imperative to many high technology sectors. Computer Room Uptime was recently involved in cooling down a flight simulator warehouse. The problem was trying to keep several different high-tech flight simulators cool in a large warehouse during the spring, summer, and fall months. The flight simulators are multimillion dollar pieces of equipment used to train commercial pilots. This industrial cooling application involved all three cooling objectives above: People, Processes, and Equipment. People: Both the students inside the flight simulator executing the training, and the test technicians operating the simulator’s controls need to be kept cool. 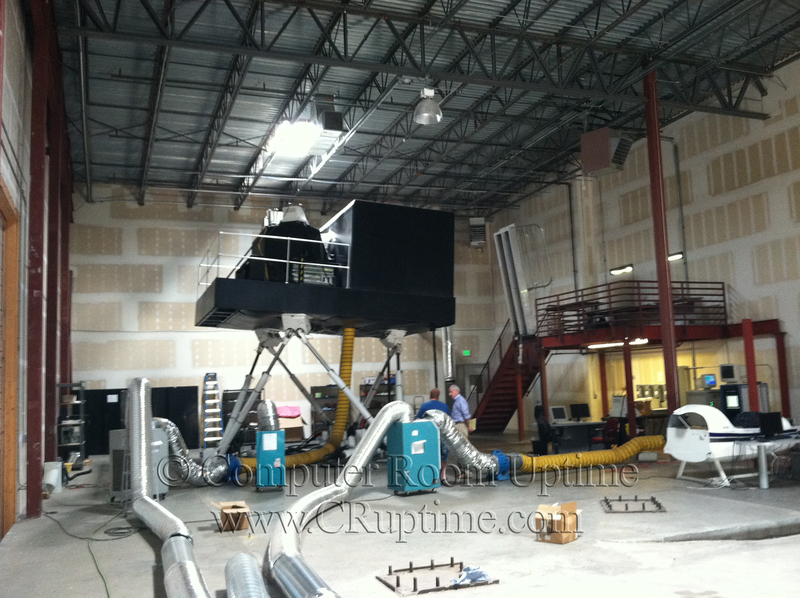 Process: To shorten the return on investment (ROI) period for the multimillion dollar flight simulators, it has to be producing revenue (i.e. training pilots) all year round (24/7/365). Therefore the flight simulators have to be cooled down to the manufacturer’s recommended operating environmental envelope during the warm spring and fall months, and especially during the hot summer months. Equipment: Excessive heat will have a negative effect on the flight simulators’ computer and hydraulic systems. The excessive heat will shorten the overall life of the simulator, and reduce the operational hours on the equipment due to increased maintenance and repairs. This unique application required several different portable spot coolers. It was essential to keep the flight simulators and control room (equipment), testing technician and student (people), as well as operating environment at optimal temperature (process). Cooling the flight simulator was the most complex application as it maneuvers in all 3 axes. The movement can be sudden and unpredictable. Therefore the portable air conditioners needed to remain a safe distance away. Fortunately the cool air can be ducted and attached directly to the flight simulator without affecting performance or damaging equipment. The spot coolers’ flexibility is highlighted with MovinCool units that can duct their cold supply air up to 80 feet away. The large warehouse space is using other portable air conditioners to cool the control room for the testing technician and its controls. 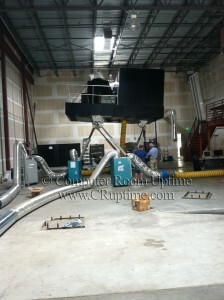 The cold air is being delivered to the control room via flexible ducting as well. 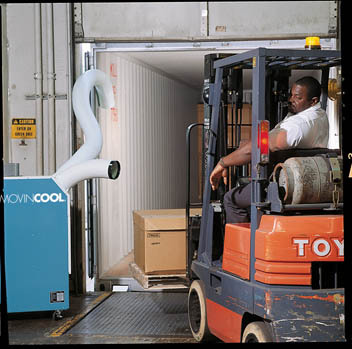 Since portable spot coolers are packaged air conditioners, the warm exhaust needs to be removed from the warehouse. MovinCool air conditioners are able to duct the warm exhaust air up to 100 feet away to an outside wall, preventing the building from heating up. 1. Significant upfront capital savings for the lower cost portable air conditioners (both equipment and installation costs). 2. Tremendous annual savings on operating expense with lower energy bills and minimal maintenance costs. 3. Highly efficient “Green” cooling solution that cools the areas that need it without wasting energy to cool unused warehouse space. Computer Room Uptime sells and rents a wide variety of portable spot air conditioners to many different industries: IT environments, Industrial / Construction, Offices / Schools, Health Care and Special Events. Our air conditioners are extremely easy to install, and will adapt to almost any environment. Computer Room Uptime will work with you on engineering the best cooling solution for your application at a fraction of the cost compared to other air conditioners. We have over 20 years of experience designing and installing portable air conditioners. Call us today at 303-908-8043 for more information on portable air conditioners. This entry was posted on Tuesday, August 20th, 2013 at 11:20 pm.